The Line of Marriage is observed in the side of Mount under the 4th finger (1) of your palm. The Line of Marriage can be observed as very small sign about the outer part of your hand. Even the Line of Marriage can be found as long line ascending from the side of your palm into the facade of Mount of Mercury. Sometimes it goes farther into your palm. If the Line of Marriage is clearly and distinctly formed then it connects with the marriage. If it is short then you have the deep affection to your love and you may consider for the marriage. But it should not enter into (2). If the deep mark is observed placing near to the Heart Line then your marriage may happen in your early life. For a successful and happy conjugal life, the Line of Marriage on Mount of Mercury must be clear and straight. It should not have any spilt or irregularity (1). If the Line of Marriage bends or sinks to the down (3) then you may live longer than the other. If the Line of marriage turns to the up in opposite direction then you may not likely to marry (4) in your life. If the Line of Marriage clear and but possess many small lines sinking from it then it foretells the difficulties and anxiety in the conjugal relation. It brings on by the weakness and ill-health of your partner (5). If the Line of Marriage possess a curve at the finishing point in addition, if a line is observed cutting this curve (2) then your spouse may die through sudden illness or accident. If the Line of Marriage finishes in a gradual bend and long into the Line of Heart then your spouse may die in prolong illness. If the Line of Marriage possesses an island at commencement then the wedding may be delayed for a long duration. Even you and your partner may be separated at the beginning of your conjugal life. If an island is observed in the centre of the Line of Marriage then it indicates that some big trouble and divorce may happen at the middle of your life (3). If an island is observed to the finishing point of the Marriage Line then the most probably the nuptial life finishes in difficulties and separation from one-another. If the Marriage Line separates into the formation of a spilt (4) then you and your partner may live separately from. If the spilt runs down to the Heart Line then it is possible that you may face divorce (5). If the split is much more highlighted and turns downward into your palm then you may expect divorce and particularly, it happens when one of the ends of this spilt stretches through your palm to the Plain of Mars or Mount of Mars (5). In few cases a fine mark can be observed crossing the whole hand from the Line of Marriage. In these cases the great ill filling and hostility may go into the battle for divorce and freedom. There is no chance to come to a settlement in the relation. If the Marriage Line is filled of small islands or connected like coils of chain then you are advised not to marry. The nuptial relation may not be fruitful. Your relation with your spouse may be full of unhappiness. You have to divorce your spouse. If the Line of Marriage is well marked and comes around the middle to split into two then it predicts that you may face a break-up or fatality in your happy conjugal life. 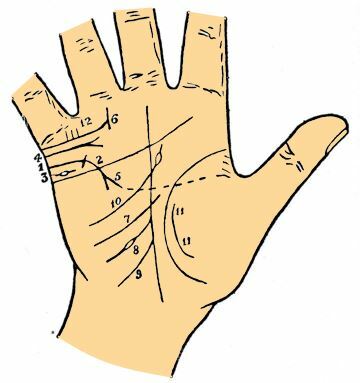 If the Marriage Line or its derivative goes into the palm and merges or climbs upper direction with the Sun Line then it indicates that you may tie the knot with a wealthy and prosperous partner (6). If the lines curves to the down and cuts the Sun Line then it indicates that you may lose your position after getting married. If any mark from the zenith of Mount of Mercury falls downward into the Line of Marriage then it indicates that you may face big difficulties to surmount after marriage. If the Marriage Line is good then you can surmount the hindrances. If there is one extra slighter line near the upper part of the Line of Marriage then it indicates that some influence may come in your life after getting married. 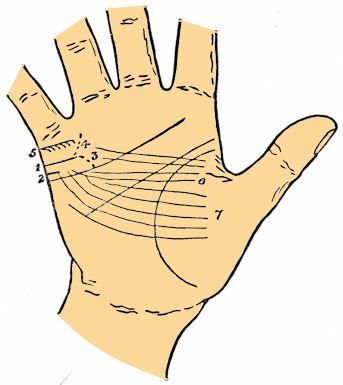 The lines which cross the palm from Mount of Mars (6) and climb up to the Marriage Line indicate the interference of persons with your marriage. These lines provide the time of interference at the time of crossing the Line of Fate or Line of Destiny. If these lines come from Mars then they may be the cause for quarrel. If they come from Venus then there is also the chance of quarrel but not in vindictive nature (7). If you have fine influence marks and join with the Line of Destiny or Line of Fate (7) then it relate to you to affect the Fate. When the Line of Influence is very powerful and join with the Destiny Line in addition, a distinct Line of Marriage is observed on Mount of Mercury then the date of your marriage may be predicted accurately where these lines are joined. The details may be received observing the Line of Influence to the Line of Destiny or Line of Fate. Coming across from Mount of Moon there is often few romantic moments in the union. If this line observes in your palm then you may meet with your partner away from your home or when you may in the travel. If the Line of Influence possesses an island then it indicates that the influence may not good. There is a possibility that you are involved in some scandals in your past days (8). If the Line of Destiny seems weaker or more doubtful after your marriage is made then it indicates that the conjugal relation may not bring success or good outcomes to you. If the Line of Destiny seems powerful and better after the joining of Line of Influence then the conjugal relation may prove to be a successful one. If the Line of sun makes its appearance at that very moment then in indicates that your power or wealth may increase. If the Line of Influence cut by the Line of Fate or Line of Destiny and it comes on the portion of your thumb then your fondness may hardly a long lasting one (7). When a wider division of the Line of Fate or Line of Destiny and Line of Influence appear as the 2 lines climb your palm together then it is obvious with the year proceeding that you may face the separation very soon. If a Line of Influence comes closer to the Fate Line or Destiny Line and goes parallel for some distances but doesn’t merge with it then it indicates that your marriage may be prevented by some big hindrances. If the Line of Influence stops in an island then the influence itself gets into difficulty, normally shame of few characters (10).